***Always read the label before using any pesticide. The label is the legal document for the product use. Disregard any information if it is in conflict with the label. ***No discrimination is intended and no endorsement is implied where trade names or commercial products are named by UVM Fruit. ***This institution is an equal opportunity provider. the cold hardy white wines tasting session. 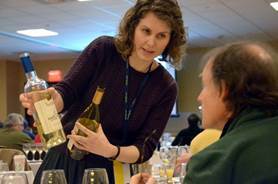 The 2016 Northern Grapes Symposium was hosted by the Michigan Grape and Wine Industry Conference on February 24th in Kalamazoo, Michigan. Nine Northern Grapes Project team members lead six sessions, encompassing all four of the projects’ objectives. Some of the talks focused on results of specific research projects, such as training systems studies, deacidification strategies for cold hardy wines, and marketing, branding, and tasting room studies. Others, however, were more general in nature, and covered topics such as the past 15 years of viticulture in Iowa and the viticultural and enological characteristics of Marquette, Frontenac, Brianna, and La Crescent, including tasting two examples of each wine. Fifteen years of trials, tribulations, and successes in Iowa viticulture. Mike White, Iowa State University. Making quality wines from high acid grapes: Yeast selection and deacidification. Brianna and La Crescent: Viticulture, enology, and tasting. Marquette and Frontenac: Viticulture, fruit ripening, enology, and tasting. Managing Frontenac and Marquette for profitability and quality: Training systems, recovering from winter and spring frost injury. Marketing, branding, tasting room studies with cold hardy wines. We would like to thank the following wineries for donating or providing wines at a reduced cost for our symposium: Coyote Moon Vineyards, Clayton, New York; Fireside Winery, Marengo, Iowa; Flying Otter Vineyard and Winery, Adrian, Michigan; Northern Sun Winery, Bark River, Michigan; Parley Lake Winery, Waconia, Minnesota; Shelburne Vineyard, Shelburne, Vermont; Staller Estate Winery, Delavan, Wisconsin; Tucker’s Walk Vineyard, Garretson, South Dakota. This entry was posted on Monday, March 7th, 2016 at 8:48 pm and is filed under Grape. You can follow any responses to this entry through the RSS 2.0 feed. Responses are currently closed, but you can trackback from your own site.